Have you ever noticed that your parents, or whoever raised you, have a major impact on your life? Our parents are the voices in our heads. Because the opinions that our parents had impacted us on a deeper level that we didn't even know about. This mindset coaching article will reveal how much of our analytical mind is actually our parents point of view. Opinions are like assholes, we all have them. Giving someone your opinion doesn't make it right, it's your opinion. We say that opinion based on what benefits us. Right or wrong it's just how most people are wired. Because of our parents or whoever raised you, that's where you get that inner voice from. Unless you do the work to change that voice, it will always be the same. Everything I remember from my childhood has made me who I am today. Good, bad, or otherwise. I'm grateful for my childhood becuase my parents did an amazing job. I've been told my entire life by them that I can do anything I put my mind to. They are the first ones, however, to question every single move that I made in my early years. While that seems like a dig at them, it's not. Parents only want the best for their children. At least that's what my belief is. Sometimes that's not always the case and I feel bad for people who have parents like that. Parenting out of fear is what leads children to repeat the same mistakes parents made. We can only measure what we lose when taking risks, not what we will gain. Because my parents questioned everything I did, it made me plan every move before I told them my plans. That has helped me develop my “Concrete Mind”. I use to only be able to think about one step at a time and think there was only one outcome. My parents helped me realize that there are many outcomes. It has created a sense of faith that provides me the guidance needed to follow my heart. When we go through life listening to that voice in our heads that tells us not to do something because it's too dangerous or scary, that's our parent's voices in our heads. Our parents voices are in our head because we allow them to be there. We care way too much what they think. Why? Because we love them so much that we don't want to disappoint them. Right? For whatever your reason I'm here to tell you that living for them is wrong. If you're 100% happy with your life, then I'm wrong. If you're not, then I'm right. Whether you're living for your parents, girlfriend, boyfriend, aunt, uncle, grandma, grandpa or whoever, you live for you. Do what your heart or your soul says to do. Forget about your parents' voices. You have one shot at your life. It sounds corny and cliche, but it's true. Until you take full responsibility for your life, you will never break free. That's the very reason our parents are the voices in our heads. If your parents give you money or provide for you somehow that will hold you back forever. Give yourself permission to fail. That's where the fun happens. I'm wrong about many things and own up to it every time. Failing has become my favorite pastime. The voice in my head has become very quiet lately and my heart has turned up its volume. 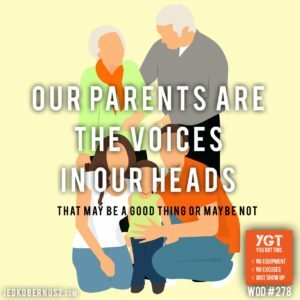 Our Parents Are The Voices In Our Heads And How Do I Get Them Out? Daily practice of what you want to in your life. Get very clear with that. Try many things and do only what you enjoy. Happiness is greater than currency. For me, I journal, workout, meditate, talk with people who make me feel happy, and write about my life. I do this EVERY SINGLE DAY. Our parents are the voices in our heads, but they don't have to be. Let me tell you this though, be ready for your life to fall apart. Because it has to in order to come together in the way you want it to. Things will get worse before they get better. They don't have to, but it seems like 99% of people have it happen like that. That's what happened to me. I have had many high paying jobs and none of them have provided me with full fulfillment. It's only when I started working on myself and working for myself I started to break free from my parents' voices. It's all true and they are words I live by daily. All of my coaching articles come from consistent inner work and empathy. If I haven't been through it, I don't speak to it. Or if I do speak to it, I conceptualize it as if I were going through it. Empathy is what drives me. That and regret. Do yourself a favor and realize that our parents are the voices in our heads when we start out living our real lives. As a result of that realization, you'll see that it's time to shut them up. What benefits them doesn't necessarily benefit you. Because it's your life. And if they truly mean “You Can Do Whatever You Put Your Mind To”, then they will eventually come around. Get out there and do you. What makes you happy? I mean truly happy? I'd love to hear about it. Email me at [email protected] with the subject line HAPPINESS and hit me up. It would mean the world to me. 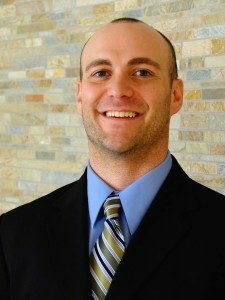 PSS: If you found this WOD and mindset coaching article about how our parents are the voices in our heads valuable and it provided value, consider giving an At-Will Offering. Because then I can keep helping. Go Here To Give. Thank you for your time, attention and generosity. If you have any suggestions or any questions for me with this post or want to know more about my services, consider sending me an email at [email protected]. Ever since I started the doing the WODs daily I noticed my body changing in a way that I never thought possible with such a little amount of work. You have 23 hours and fifty minutes to recover. At the very least it will take you 90 Seconds to complete a WOD. Too many people discredit small amounts of intentional work. What I mean by that is just because a “workout” isn't intense doesn't mean there aren't benefits to be had. Since the early sixties, the concept of sweating equals hard work has been engrained in our head. Just because you don't sweat it doesn't mean that your body isn't getting any benefit. 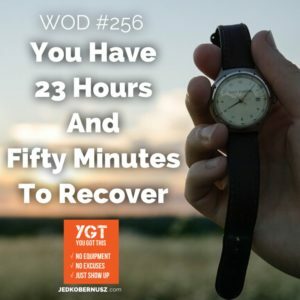 Once you've completed at last one round of your WOD you have 23 hours and fifty minutes to recover. That's just an average of course because sometimes it will be longer and sometimes it will take shorter. That's what it's all about though is averages. No matter what happens from the time you wake up until the time you go to bed, commit to one round. When you choose to commit to one round per day you'd be surprised on what other choices you make throughout the day. Instead of having two pieces of cake and a pop you'll have half a piece and skip the pop. After you acquire the consistency to get one round of a WOD done each day you won't want to mess anything up. Because you've worked too hard and have been consistent too long. After each WOD you have 23 hours and fifty minutes to recover. That doesn't seem like a ton of time, but because I've created each WOD with intentions of recovery in mind. With that mindset of your primary and secondary muscles you won't over train them. Sometimes it will feel like some movements simply go on forever. It's because of that feeling is why I change it up every single WOD. It takes a certain level of fortitude you'll need to be so consistent because you're going to have people tell you that 23 hours and fifty minutes to recover isn't enough. I assure you it is. It's time to put the rubber to the road and get today's WOD done. PSS: If you found this WOD about how you have 23 hours and fifty minutes to recover, then consider an offering. Because then I can keep helping you out. Go Here To Contribute. Thank you for your time, attention and generosity. Whether you can or cant you are right either way. Our minds get the best of us sometimes and we don't even realize it. Becoming familiar with what kind of self-talk you have is something I work on with everyone around me. Sometimes people get it right away and sometimes they don't. It tears me up every time I hear someone talk to themselves and they refer to themselves as a dummy or idiot. Or even worse they say they can't do something when in all reality they can, they just aren't seeing that they are in their own way. When you talk your subconscious mind writes that down on paper. That writing doesn't erase very well after the age of 35. Before age 35, your subconscious mind writes with a pencil. Thoughts and commands aka how you talk about yourself and your life, are written in stone but can be erased. After a person turns 35, it's harder to change habits. At that point, the pencil becomes a sharpie marker. Not so easily erased, more permanent than anything else. In today's world of fast information, however, it is possible to erase those thoughts and beliefs. Whether you can or cant you are right either way. Saying that you can't do something will dictate to your subconscious mind and will make it so. The same goes for when you say you can. It's when we realize that we have that kind of power that we start to talk differently. Notice the word differently, I didn't say right or wrong, just differently. Because in all reality, there's no right way, there's no wrong way, there's simply YOUR way. Whether you can or cant you are right either way. Keep that saying close as you retrain your brain. Instead of saying “I Can't”, try saying “That skill is not available to me right now.” What that does is leaves an opening for the possibility that you may be able to do “it” later. We may be our own worst enemy, but we can also be our own #1 fan. Another way to put it is, you are your own problem, but you are also your own solution. Admitting that the skill isn't available to you right now gives you the opportunity to explore the opportunity of gaining that skill. Notice the word gain, our minds are wired to measure everything from what we've already experienced. What I mean is, we can only measure what we will lose and not what we will gain from any experience. We gage that “loss” by past experiences. That's how the mind works because we need to “survive”. Living in survival mode is something that most people can't seem to shake. Gain and possibility go hand in hand. Whether you can or cant you are right either way. What you gain from changing the way you say you can't, will open up a whole new way of thinking, doing and being. Also, another side effect of this change will get your mind out of “survival mode”. You will see every struggle as an opportunity. You will see every confrontation as another way to grow. Seeing those daily battles as ways to improve yourself versus things that are always against you. Loving the struggle is something that I've come to embrace. As soon as you realize that you can do whatever it is you want, life becomes way more interesting. Because you have this new found perspective you might get a little overwhelmed because having everything isn't the norm for you. It's ok, everyone who “wakes up” has this happen to them. Once you realize that you don't need “everything” you see how simple life really is. Beginners see MANY choices that they can pursue. Masters see only one choice. That will make sense once you practice this way of thinking, doing and being. Whether you can or cant you are right either way. Because you have this perspective, you now take that saying and lock in in your mind without any emotional attachment. Once you do that, it will be imprinted in your sole as wisdom. So many people get emotionally attached to what they can't do and forget about what they can do. With each WOD I create, do and share, I find modifications for each movement. That way when a person tells me I can't do that, I always have a movement that they can do. Just because a full push-up isn't available at this moment, doesn't mean it won't be available in the future. Celebrating the fact that you're doing a push-up on the wall or on your knees is a massive shift in your mindset. I've had a client that just wouldn't try a push-up on his knees because he didn't think it had any benefit. He eventually tried it and soon realized that when he did it, he got more depth with his push-up. More depth aka range of motion means more strength. He was very surprised that he got sore from push-ups on his knees. The stereotype of push-ups on your knees being “girl push-ups” stopped him. That was imprinted in his mind from society at a young age, as we all have. Getting our minds to change isn't easy, especially if we are 35 years or older. However, it is possible. Whether you can or cant you are right either way. With every thought, belief, and word said you are in control of your life. Becoming familiar with those thoughts, beliefs, and words spoken is how you change. Why not start with the way you move your body. That's what today's WOD is all about. And why you're at it, be nice to yourself. Forgive yourself for what you've done or haven't done yet in your life. 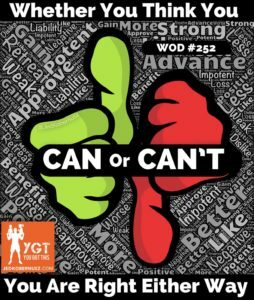 PSS: If you found this WOD about whether you can or cant you are right either way, consider contributing to the WOD fund so I can build my gym. Becuase then I can keep helping you out. Go Here To Contribute. Thank you for your time, attention and generosity. Did you enjoy this post about talking about whether you can or cant you are right either way? Please share and/or comment. below. I come on too strong but my passion is always on fire. After working so long on myself I've found that if I don't absolutely love what I'm doing I start to audit why I'm doing it. That goes for all most of my blog posts too. When I started creating the 365 WOD Journey I didn't have a clue what I was doing. To be truthfully honest, I still don't. It's ok not to know what to do, but letting that stop you is only an excuse. I come on too strong but my passion is always on fire. My passion comes from a place that most ignore. My heart beats hard when I'm creating or working from that place. It's all about being 100% honest with yourself. I can be pretty polarizing to people. I'm good with that because I only want to work with people who are in alignment with me. Some people simply aren't ready to work with me and I'm ok with that. I come on too strong but my passion is always on fire. To some that can come off as intimidating. To others, it can seem very cold. If you do the work, then you will succeed. Work is one of my favorite pillars I lean on when it comes to “making it”. The “all or none” theory is another excuse that gets in people's way. The passion it takes to make a permanent change can be scary because it means parts of our current lifestyle have to go away. Those permanent changes also mean that parts of you have to die. I come on too strong but my passion is always on fire. Sometimes people take my passion and think that I don't care. I do care and actually, I care too much. Sometimes I invest too much emotional energy in people's journey. It's burned me in the past and I've gotten 98% better at auditing that. Coming on too strong helps that in a way because then people can either go with it or go away from it. It's actually a built-in defense mechanism so I can play more offense. I'm usually not on the defense because of that very reason. I come on too strong but my passion is always on fire and because it burns so hot I'm ALWAYS playing offense. It could be 3 AM and I'll still be just as enthusiastic about all the WODs. That enthusiasm doesn't stop with working out. It crosses over to mindset, meditation, self-awareness, nutrition, healthy spending habits, DIY projects and many other interests. Not knowing how to do something has never stopped me before. Since the dawn of YouTube, I've been fascinated with the amount of content on the platform. I come on too strong when I think I can fix everything myself. What's really cool though is someone has recorded themselves fixing something or doing something about 90% of the time. We simply need to look at it as a fun challenge versus the end of the world. My approach to “fixing” something is that it can't get any more broke. As I write this I realize I digressed from health and wellness and into more general life principals. See how ADHD works? In my mind, I saw a shiny object and totally dropped what I was doing to go check it out. Back to how I come on too strong but my passion is always on fire. After a person works with me for thirty days or more they start to realize that I'm in this game for the long haul. They start to see some real results. For example, my brother, who was VERY hesitant to begin the WODs, went from an XXL (Just shy of needing an XXXL) to an XL in 89 WODs. Another person who I train with twice a week has decreased his blood pressure pills in 82 WODs. He also can fit in his firefighter gear and buckle the pants. That's something he couldn't do for over five years. I don't tell you these stories to convince you to come join the #Kobernation and get you to do anything you can't do. That's for you to decide. Because whether you can or can't you're right. Understanding that may take another blog post. I love it when that happens because then I can write from the heart. True authenticity is hard to come by these days because we post pictures, videos, and audios of the best stuff possible. We don't take into consideration everything in between. For me, that's the good stuff. I'm not perfect and don't claim to be. Eating ice cream, pizza and cake are on my list of favorite foods. Drinking a beer after mowing the lawn for three hours appeals to me. Sleeping in and skipping a WOD only to do it later that day happens. My way isn't the sexiest way, but it's the most permanent. Some people see that message and think I come on too strong but my passion is always on fire. They see that passion and yet are still so afraid of the permanent changes that come. It's ok to feel afraid, that's the fun of it all. Why do you think people pay to go to a scary movie? The THRILL. The same experience we look for when we go to a haunted house or maze. To be taken through the emotional roller coaster only to be let off and wanting more. The real secret sauce comes from knowing when enough is enough. A short while back I auditioned for a reality TV show called “Pumped The Muscle Hustle” with Lou Ferrigno and Mike Torchia. Not knowing if I'd be asked to come for a live audition I submitted the video. (Go Here To See That Video). Well as it turned out I WAS asked to audition. To make a long story short, I didn't go. My wife asks me, “Why do you need some celebrity to tell you that you're awesome?” That's where it all came to me. I didn't need anyone to tell me how awesome I am. I needed HER to tell me that. In all reality, I don't need anyone to tell me that, but when the person you care about most in life, besides my children, says you're awesome at what you do, it sure feels good. When you find someone that can make or break your day with a single sentence you better do everything in your power to keep them around for the rest of your life. That's what I try to do every day. I'm not perfect at it, but when my wife said I'm awesome at what I do and that I have a gift, that's all that mattered. I don't need anything else. Creating these WODs aren't for everyone. Heck, they aren't even for ANYONE. They're for ME. My passion burns hot and I do at admit I come on too strong, but when you KNOW that what you're doing changes people's lives, you just can't hide it. It takes time, work, dedication, consistency, community and most of all self-awareness. As soon as you start talking yourself out of doing a WOD, that's when you MUST do it. To bring this point about how I come on too strong but my passion is always on fire to a head, it's all about the journey. I'm so in love with the journey that the destination, for me, is death. As soon as I think “I've made it” then I must be dead. The work, to the networking, to the creative, to the documentation. It's all in the journey. So to say that I'll be ready for all 365 WOD Blog posts to be done isn't true. So let's make today's WOD a massive step forward on your journey shall we? 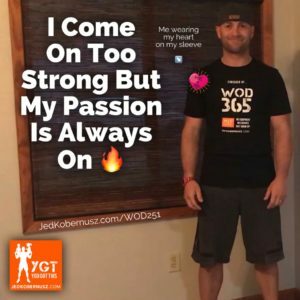 PSS: If you found this WOD about how I come on too strong but my passion is always on fire, consider making a donation.Because then I can keep helping you out. Go Here To Donate. Thank you for your time, attention and generosity. Did you enjoy this post about talking about how I come on too strong but my passion is on fire? Please share and/or comment. below. While training one of my favorite clients he said, “I use to be able to do that faster.” That prompted this post and I trust he'll read this. Stay away from the use to bees because it only leads you to shame, blame, and despair. Comparing yourself to a younger version of yourself creates the hive of use to bees. We've all been there before. Looking at our current state of health and comparing it to the twenty or thirty-something that we use to be. That's the proverbial use to bee sting. After the sting happens you then start to swell in the area of the stinger. That's the shame rushing through your body infecting your positive vibes. Then comes the shortness of breath, which is the blame for other people's toxic air and it's mixing with the allergy you have from the sting. Have You Ever Been (Your Current Age) Before? I'll spare him his age because of personal and professional reasons. But the message still applies. Have you ever been (for me 33 as I write this) before? Stay away from the use to bees takes practice and awareness. When it comes to life we only have one of them. We experience it in many different ways. Our bodies are different with each day that comes and goes. We have never BEEN our age before and comparing today's mind, body, and spirit to 10, 20, 30, 40 or 50 years ago just isn't good practice. When I hear someone talk about the use to bees I always redirect them to their current age. Being 33 means that I've been on this earth for 33 years and have 73 years left. (Assuming I live until I'm 100) Comparing what I use to do isn't relevant to the current version of myself because of my experience and awareness. After reading Becoming Supernatural by Dr. Joe Dispenza I've forever changed the trajectory of my life. Also reading Crushing It by Gary Vaynerchuk and Your Money Or Your Life by Vicki Robin and Joe Dominguez. Heck reading ANYTHING besides a textbook is leaps and bounds for me because when I was in my teens I HATED to read. Some may think that's “normal” but for me, I read out of necessity, not for learning. It's crazy to think that people go a lifetime not even realizing that they have a swarm of use to bees around them constantly. However, there are ways to getting rid of them. At this point, I grab an EpiPen and stab it into your thigh (AKA wisdom that I've learned from the above sources.) Therefore, the proverbial symptoms of the use to bee will go away, for good. Learning how to stay away from the use to bees is like other changes that I've helped my clients with. I use to bee (Sting) able to do that faster when I was younger. I use to bee (Sting) stronger but now that I'm older it's harder. Flexibility use to bee (Sting) my friend but age is the bully that knocked it out of my group. 2. Look for more positivity and grace. Postive people have a certain way of lifting people up in a way that spreads like wildfire. Also become aware of shame and blame. They are two bash brothers that like to gang up in your mind and beat down EVERY awesome thing there is to become the best you possible. Forgive yourself for what have or haven't done with/for yourself in the last how many ever years. Then surround yourself with people that elevate you or make you feel light. If they make you feel heavy, squash them like a bug. Or a Bee (However, not real Bee because they are VERY important to our ecosystem, just sayin). 3. Shut out off of the noise about what you're missing. Today's media likes to show us what we are missing. All the adds are geared towards this and when we allow ourselves to watch them they take us on a subconscious vacation. From there we start to think that being old is a problem. Having a small ache in our elbow means we have #OsteoSitOnTheCouchItis. Then the drug that they are saying will cure it has more side effects that outweigh the proverbial cure. Those three steps will help you to stay away from the use to bees for good. Of course, there are more things a person can do, but let's start there. When you've mastered those email me at [email protected] and I'll give you more. Becuase changing too fast will only leave you worse off than before. Check out WOD #249 about the Biggest Loser Mentality Might Keep You From Losing. Thank you for forgiving yourself. Doesn't it feel good? And Don't you feel a massive weight lifted off your shoulder after getting rid of your use to bees? I sure do and loving each day like it's the BEST day of my life has served me very well. 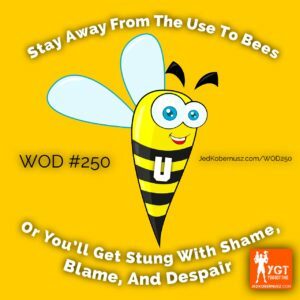 PSS: If you found this WOD about how to stay away from the use to bees, consider making a donation. Because then I can keep helping you out. Go Here To Donate. Thank you for your time, attention and generosity. Did you enjoy this post about talking about how to stay away from the use to bees? Please share and/or comment. below.